I had started playing the SNES Zelda and was everything was proceeding well on Link’s quest until I starting playing the latest Dance Dance Revolution’s quest mode. It was downhill from there in terms of playing Zelda. The DDR quest has been an addicting venture, striving to earn the best reputation at main cities throughout North America. However, this was nonsensical to Andre, the Zelda advocate for a better tomorrow. Fortunately, I regularly practice locking my doors and therefore have been able to avoid the hypothetical comic situation thus far. I caved in and bought one of those Playstation 2s I heard about from time to time here and there. The years of other people having the latest MGS titles must have gotten to me as I picked up MGS3 Subsistence to go with it. Even though I probably only played for thirty minutes out of the first two hours, that game’s quality stands out as one of the best games this generation and the “next”. The only reason a next generation of consoles is on its way/here is so the console manufacturers can continue having their money fights because there isn’t really a need for new hardware based on the level of graphics of current gen games. Nintendo has the right idea by innovating in gameplay instead of focusing on more power. Thanks to everyone who continued requesting comics. 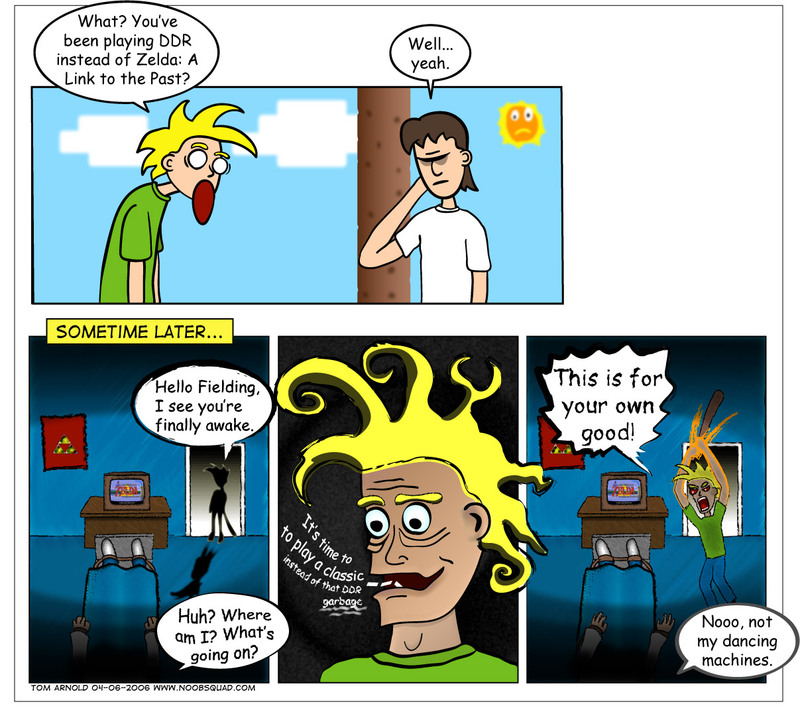 “n00bsquad: The Rareware of Comics” still holds true.